Should i use Performance or Energy fuel? If you are training or racing competitvely, or maybe profusely sweating when exercising, the specialised electrolyte profile based upon the AIS (Australian Institute of Sport) recommendations for carbohydrates and sodium may be the most beneficial option for you. If you require more energy for longer exercise just over the weekend, more of a weekend warrior requirement, then the standard energy fuel is a trusted and tried formula that will do the trick. What is Endura Rehydration Performance Fuel? It's a Maximum Performance Rehydration solution. Endura Rehydration Performance Fuel features a specialised electrolyte profile designed for maximum performance rehydration. Rehydration Performance Fuel contains sodium and potassium at levels recommended by the Australian Institute of Sport (AIS) to maximise hydration and performance in endurance athletes. Replaces essential electrolytes lost during exercise. Improves performance, endurance and stamina. Exclusive Meta Mag® Magnesium to help prevent muscular cramps and spasms and relieve aches and pain. 20 g of carbohydrates per dose to fuel performance. Endura Rehydration Performance Fuel rapidly replaces fluid and electrolytes lost during exercise while improving stamina, endurance and performance. Loss of fluid and electrolytes, if not replaced, can result in dehydration and electrolyte imbalances which may affect exercise capacity and performance. What is Endura Rehydration Performance Fuel for? Replaces electrolytes lost in sweat. Provides sodium and potassium at levels recommended for athletes in endurance events. Helps prevent muscular cramps and spasms. 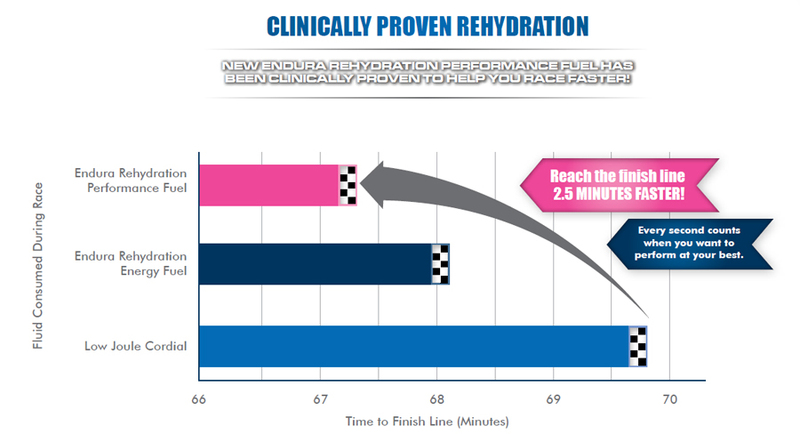 Endura Rehydration Performance Fuel is a 6% carbohydrate formula, providing 20 g of carbohydrates per dose as recommended for intense exercise or exercise lasting longer than 1 hour. The combination of fructose and maltodextrin improves carbohydrate absorption and fluid uptake. Endura Rehydration Performance Fuel contains the exclusive and easily absorbed Meta Mag Magnesium. Magnesium is an essential mineral for athletes to help prevent muscular cramps and spasms and relieve aches and pains. Buy Endura Rehydration Performance Fuel from Fitness Market and save! With our efficient dispatching and quick delivery throughout Australia, Endura Rehydration Performance Fuel can be yours sooner. Below you can rate and add reviews for Endura Rehydration Performance Fuel.